The GMC Terrain Denali has been redesigned for 2018. The new crossover is sleeker and smaller, but it still exudes GMC purposefulness. We think it competes under the radar with big-name luxury brands. GMC and Buick are companion brands in the General Motors hierarchy, sitting between mass-market Chevy and upscale Cadillac. As such, they hold down the tricky near-luxury space. Near-luxe was more important when GM sold more brands. You didn’t jump from Chevy to Caddy – you passes through Pontiac and Oldsmobile and Buick to get there. Buick has traditionally appealed to affluent suburbanites, while GMC was more of a truck brand. 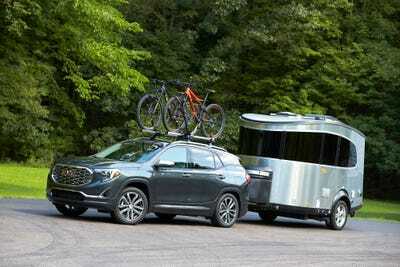 But now with SUVs and crossovers resurgent in the US market, GMC and its premium Denali trim level have a entirely new role to play, that of a almost-luxury competitor to true luxury brands, but with a bit more robust capability for activities like towing trailers. We’ve been generally impressed by GMC and especially by Denalis – the Acadia was one of the best SUVs I drove in 2016 – so I jumped at the chance to check out the mid-size Acadia’s little brother, the compact five-passenger Terrain Denali. This SUV has a base price of about $US32,000, but our 2018 all-wheel-drive vehicle stickered at a well-optioned $US44,370. To put it bluntly, the Terrain Denali is absolutely tempting if you live a typical suburban existence, face down bad winter weather, and make occasional forays into the wilderness and have stuff to tow. The crossover shares a platform with the Chevy Equinox, an SUV we’ve expressed some qualified enthusiasm for in the past. Looks-wise, the Terrain has that rugged, competent GMC thing, although the 2018 comes with a “floating” roof – the roof appears to hover above the Terrain’s body. Still, it comes off tougher than the Equinox, and it certainly exudes a truckier vibe that many other crossover, which are erring on the side of resembling beefed up sedans or wagon, rather than domesticated SUVs. This is really what makes GMC stand out as a brand: its pickups look far more chic than their mass-market cousins, but its crossovers occupy a middle ground between purposeful utes and snazzy luxury rides that would recoil from actual dirt and mud. Compared to Terrains of the past, the second-generation vehicle is smaller and lighter. The downsizing is a positive, as the all-new Terrain is a breeze to drive: stable, relatively quiet, but also manoeuvrable, with easy steering, responsive brakes, a firm but not stiff suspension. You can sense that if you took it offroad it would be able to manage some rocks and trails, so long as you didn’t push your luck. There’s a selector between the seats that allows you to switch setting, depending on the conditions. The nine-speed automatic transmission never struggles and helps the Terrain yield a decent 21 mpg city/26 highway/23 combined. Cargo capacity is fine for weekly grocery runs and could handle a family of four’s luggage for a weekend trip. 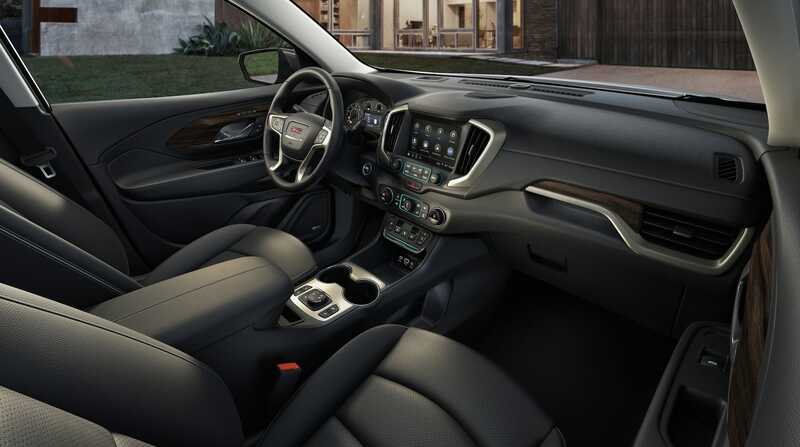 On the technology front, the vehicle comes with GMC’s version of General Motors’ excellent infotainment system, which makes Bluetooth device pairing a breeze, connects with OnStar to provide 4G LTE wifi, and provides AUX/USB options to go along with SiriusXM satellite radio, good voice recognition, Apple CarPlay and Android Auto, and capable built-in navigation. The Bose premium audio system sounds great, as it has for us on every GM vehicle that’s been equipped with it. The options list on my tester added up to just over $US4,000, much of which was consumed by a large sunroof. The rest was made up a suite of driver-assist features, including lane-keep assist, forward-collision warning, and automatic braking. We also got heated a cooled front seats and heated rear seats. 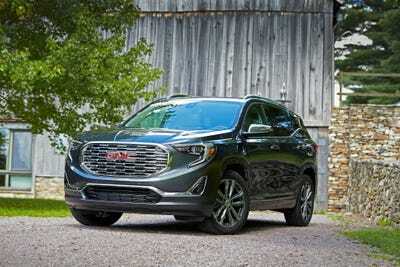 In all, a lot of vehicle for the money, and in the Denali trim, a worthy alternative to flashier crossover offerings from the major luxury brands, with whom GMC is stealthily competing.